Adds some diversity to Skyrim creatures, and generic NPC's, by dynamically resizing them. Customizable with the MCM. Fixed issue with changing damage. Cleaned up the main script. Deleted vanilla race edits for better compatibility. Changed MCM so race names will still display correctly. Added extra check to make sure the mod doesn't affect your player. An asterisk will now appear by the selected race in the creatures and humanoids pages. I added a warning about resizing dragons. Fixed the general humanoids display settings in the MCM. You can now limit all races independently. Each race can have their own stat limits if you wish. The mod will detect new creature and humanoid races which you can then limit independently. Got rid of the user limits, as they are irrelevant. Updated the MCM to be easier to use. 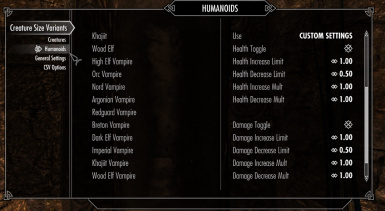 Humanoid NPC's magic destruction damage isn't affected any more, only physical damage. Incorporated brawl bug fix. Cloak is now disabled during brawls. Added a CSV Option page in the MCM so it's easier to get back to if you're already in the menu. Added the creature size variants toggle spell to the CSV Spells option in the MCM. Fixed issue with the max stat limiter. Added the option in the MCM to remove or add the CSV spells so they don't clutter your magic list. Optimized main script for better performance. Added the ability to save and load a FISS preset. Forgot to add the new defaults to the slider parameters, instead of just the CK global variables. They are now included. 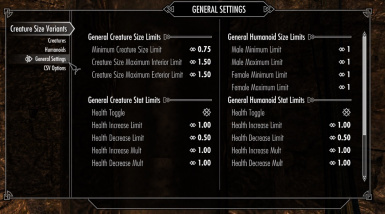 Redid humanoid default limits again, and fixed one that was left over from a version before 1.6. Fixed the start game bug where the mod made the carriage ride buggy. It was resizing the cart driver. I added a check so the mod won't resize any actor who is sitting. Added actor race check for horses, so that any race that is named "Horse" will not be resized. Should make sure horses added by other mods aren't resized. Minor script changes, mostly to the debug notifications to make them more specific. Added user defined limits, and a spell to set them. Added ability to restrict mod to NPC's that are scaled to 1.0, or vanilla size. Added ability to set the percentage chance that NPC's are resized. Made it so it is impossible to set maximum limits below minimum limits in the MCM. Now excludes giant frostbite spiders, which should fix the web bug. Fixed some major oversights to the stat limits in the script. The mod now by default is inactive. It causes the game's opening sequence to be buggy, now you can activate the mod later to avoid this problem. Removed the config book, which should have been done as soon as I added the MCM, I just forgot about it. 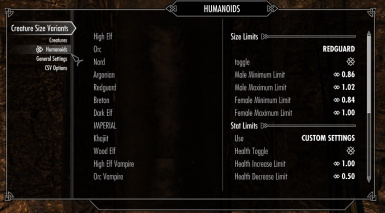 Redid humanoid default limits, they are now less extreme. Reduced cloak radius, helps with performance. Removed failsafe as it's not necessary anymore and was causing CTD's in some cases. Fixed problem where dragon's were not being affected. Fixed problem where general creatures weren't being affected. Changed the way the mod functions. NPC's will now be resized to a random amount between the minimum and maximum limits set in the MCM, rather than being increased or decreased based on their current scale. This prevents NPC's being resized too big or small if for some reason they are resized more than once. It's also better for performance as the script has less to do. Removed testing debug notifications from previous version. Got rid of the damn test notifications again. Re-did the failsafe again and is now working the way I want. The respawn spells will now no longer respawn dead NPC's. The mod should be more compatible with mods that add variants of the vanilla races, as the mod now checks the race name and not just the vanilla race form. Fixed number interval option for the creature size exterior limits in the MCM. Fixed issue with the failsafe. Failsafe will not affect unique actors anymore, should fix follower bug. Fixed issue where re-spawn spells would affect unique actors. Now they won't. Added failsafe to script to prevent resizing more than once per actor. Fixed blank MCM problem if updating from a previous version. Can limit creatures in interiors and exteriors separately. Can now resize humanoid NPC's and limit males and females separately. Added area effect and aimed spell to set creature sizes back to normal. Mod will alter creatures' damage, (physical and destruction magic) along with size. Configurable with the MCM. Thanks to Preykousis and Brodual for the reviews! -You can now limit all of the creature and humanoid races independently. The mod will also automatically detect new humanoid and creature races. Up to 55 new creature races and up to 85 new humanoid races. After they are detected you can set customized limits for them in the MCM. - Each race can now have their own individual stat limits. - Updated the MCM so it's easier to use. Click on a race, then set its limits. - I got rid of the user limits, as they are now irrelevant, BUT if you were using the user limits, races already in them will automatically be transferred to the new system with their settings intact. - A note to mod author's: if you don't want to wait for a race to be detected by this mod. 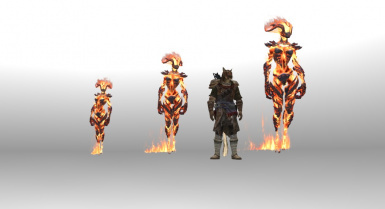 Use this mod as a master and place the new race in the FormList CSVCreatureList or the CSVHumanoidList and the mod will take care of the rest. Do so with a script, CSVCreatureList.AddForm(NewRace), though and not in the CK because the order that races are added determines which global variables they use. Using a script will ensure other races aren't bumped out of position. DON'T MESS WITH THE OTHER LISTS! If updating from a previous version, please wait until a message box shows that csv was updated to 2.0. Also, if you were using fiss, you have to re-save your settings. Your old settings won't load. This mod aims to add some diversity to the creatures of Skyrim by dynamically and randomly resizing them. The mod will also increase or decrease their health and damage based on how they are resized. (You can disable these features if you want.) I also added the option to resize humanoid NPC's and limit them separately as well so that they are resized based on their race. This mod is fully customizable. 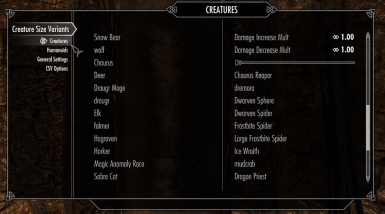 The mod does not affect unique actors, horses or giant frostbite spiders. Giant ones aren't affected because this can cause a bug, (pun not intended) but other spiders are affected. The mod will add a cloak effect to your character that checks nearby NPC's. If the NPC is not unique, the mod will resize the NPC by a random amount between the minimum and maximum limits you have set. If the NPC is resized bigger than its original size its health and damage will increase, if it's resized smaller, its health and damage will decrease. You can set the max amount the NPC's health or damage can be increased or decreased by. More on this below. The scripts are lightweight and will only fire once per actor. You can limit all races independently of each other. Each race can have their own stat limits as well if you choose. If they are set to general settings, they will use the settings on the general settings page. The mod will automatically detect new creature and humanoid races added by other mods, up to 55 new creature races and 85 new humanoid races, which you can then limit independently. You can set the chance percentage that an NPC will be resized on the main page. Default is 70%, which means applicable NPC's will be resized around 70% of the time. If set to 100% all applicable NPC's will be resized. Setting max size increase limits above a value of 2.0 isn't recommended for normal gameplay. 2.0 is 100%, or double the size. I only added higher numbers as an option for fun/comedic effect. Make sure you backup a save before setting them to high numbers. CSV Reset Size Aimed. Aimed spell which returns the target's size back to normal. Only size, not stats. CSV Reset Size Area. Area spell which returns all actors' sizes back to normal. Only size, not stats. CSV Respawn Aimed. Respawns target if it is not unique. If the mod is active, it will be resized again. CSV Respawn Area. Respawns all actors in the area, if they are not unique. If the mod is active, they will be resized again. You can add or remove the spells on the main MCM page so they don't clutter your magic list when they don't need to. Be forewarned that the Respawn Spells will kill the NPC's before respawning them. You can use the Respawn spells to see how changing size or stat settings affect actors. 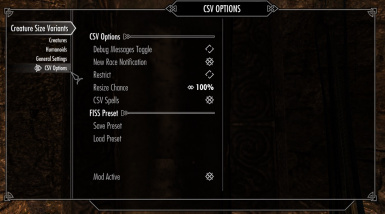 You can also de-activate the mod and use the spells to have NPC's return to vanilla settings. The stat changes are based on how the creature's size changes, but you can change them to be more or less with the Increase or Decrease Mults. Default is 1, which is a 1 to 1 ratio. So if the creature's size is increased by 0.5 it's health and damage will be increased by 50%. Set them lower than 1 to have the stats be affected less, and higher to have them be affected more. They also will never go above the limits that you set. As of version 1.8 you can now save a FISS preset so you can easily load your settings when starting a new game. Note that races you added to user limits aren't saved, you will have to add them again with the spells but the size and stat limits are saved. If you don't have FISS installed the FISS options won't show up in the MCM. Version 1.6 or above may conflict with other mods that use SetScale to change generic NPC sizes in game. Mods that change the base scale of NPC's are fine. As of version 1.7 though you can restrict the mod so that it only resizes NPC's whose scale is 1.0, or vanilla. This will prevent the mod from resizing NPC's that are resized by other mods. Nothing will break your game though and if you know how the mod resizes the NPC you can configure this mod to work with it. Let's say you have a mod that sets a Giant's scale to 2.0. 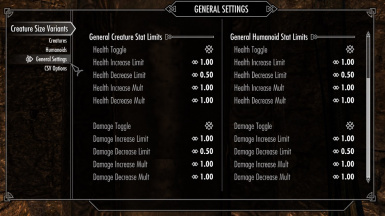 If this mod's range for giants in a minimum of 0.75 and a max of 1.5 this mod will only be able to decrease the giants size, and will also decrease it's health and damage if those are enabled. So instead set this mods Giant range to a minimum of 1.75 and a max of 2.5. In Version 2.0 I renamed some of the race display names, so I would recommend loading the mod early in case other mods do the same thing. If other mods rename race display names, they will show up that way in this mod's MCM. The mod won't affect unique actors, giant frostbite spiders, or horses. FISS is required to use the preset. You don't have to use FISS though if you don't want. The Brawl Bugs Fix is highly recommended as this mod uses a cloak effect that could cause a brawl bug. As of version 1.8.5 the cloak will be disabled during brawls, but I still recommend the patch as it fixes other issues with brawls and it's good to have all of your bases covered. Extract to your Skyrim/Data folder, check in your load order and activate the mod in the MCM. If updating from a previous version, de-activate mod and cast the CSV Respawn Area spell, if you have it, which will reset NPC's in the area. Then install update and activate the mod again. If you are updating from a version that doesn't have the CSV Respawn Area spell, cast it after you've installed the update to have NPC's resized correctly. 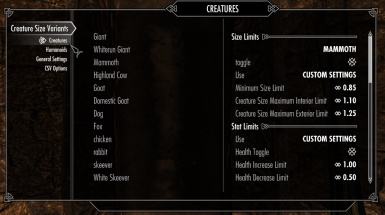 Disable the mod with the Creature Size Variants Toggle lesser power, or the MCM. cast the CSV Respawn Area spell to have NPC's in your area return to vanilla, then remove or uncheck the esp. I used the Light Room mod for the screenshots. Thank you to everyone who has commented, endorsed or otherwise supported this mod. This mod is Nexus exclusive. You are not allowed to upload to other sites. You are not allowed to use this mod or it's assets to make money. You are free to modify or use the assets from this mod as long as you adhere to the conditions above and let me know about it. Thanks.